And this is my first on this challenge! LOL! Well, I've practiced and wasted a few stamped images before I got satisfied with the outcome. Hmm, I don't know if I did it right, LOL! but hopefully, one day I'll get there. So that means more practice for me. :) If you wanna know more about this challenge, head on to Mad for Markers blog. I haven't been colouring any Tilda lately that's why I once again felt like a first-timer with Copics while I'm colouring her. 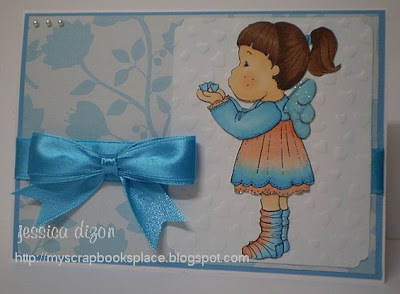 The wings (and petticoat) were embellished with Martha Stewart Crystal Fine glitter and finished off the card with this Aqua satin ribbon made with Bow Easy and 3 small Kaiser pearls. Tilda's white background was sponged a bit with Tim Holtz Broken China Distress Ink and embossed with Fiskars Hearts Texture plates. The dp is from DCWV floral stack. Thank you for looking and I'll see you next post! This is gorgeous Jhet, your Feathering is beautiful. Thanks for joining us at Mad 4 Markers. 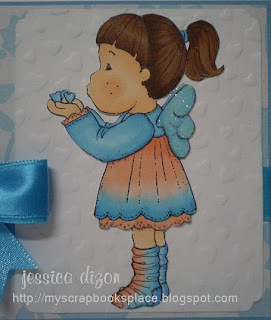 This is so pretty - your feather is so well done - your Tilda is so sweet. Your feathering looks Awesome Jhet! I love those colors feathered together, they look great together! Thanks so much for joining us at Mad For Markers! This is so sweet Jhet!! LOVE it!! Great background! Look forward to seeing more feathering from you in the future too :D Thanks for joining in our challenge! Really cute. Love the colour choice, and her sparkly wings are the cherry on top! What a great job you did with this challenge. Thanks for joining us at Mad for Markers and good luck.